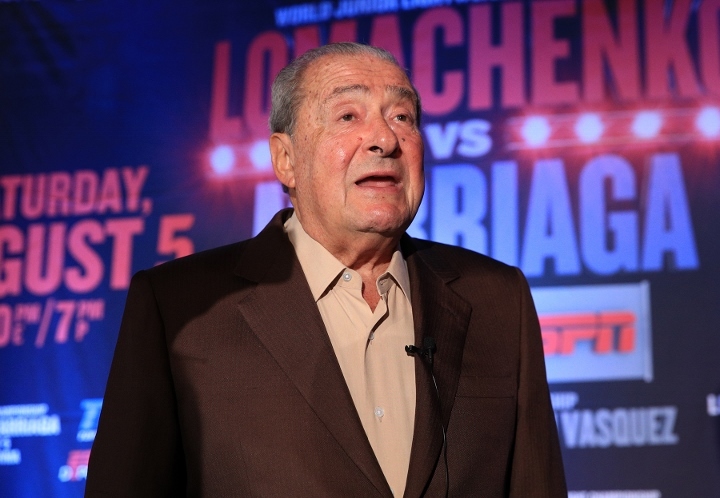 Top Rank’s CEO Bob Arum is in disbelief after fellow promoter, Golden Boy Promotions CEO Oscar De La Hoya, issued a fight challenge to UFC President Dana White. De La Hoya, a former six division world champion, was promoted for most of his career by Arum’s company. The war of words between De La Hoya and White has been brewing for well over a year. Their rivalry heated up in the last few weeks, after De La Hoya staged the first Golden Boy MMA pay-per-view event – which was headlined by a trilogy bout between UFC Hall of Famers Chuck Liddell and Tito Ortiz. De La Hoya intends to continue his run in MMA – because he feels White and the UFC are not properly paying MMA fighters. In a recent interview, the Golden Boy upped the ante – challenging White to settle things in the ring. He even took a jab at White for allegedly using steroids. “Let’s get in the ring,” De La Hoya stated on “The Luke Thomas Show” on SiriusXM. Arum felt that it was absurd for an ex-pro with the level of experience of De La Hoya to challenge a near 50-year-old executive, who has little boxing experience. “Isn’t that stupid? Oscar made a fool of himself. He’s a boxer, poor Dana White is a talker. Oscar is a boxer. What the hell are they talking about? The dialogue they have between them is pretty good, sort of funny. But the idea that Oscar is going to fight Dana White.. or anybody else is like stupid,” Arum told TMZ.